The new gym I go to has a really nice shower situation, so I’ve started showering immediately after workouts there, which is not something I’d ever done before in my life. It’s fantastic. But it also introduced the possibility that I might accidentally grab some of The Wife’s clothes when packing up my change of clothes for the gym (I grabbed straight from the clean laundry pile), and then, as I’m putting on my Khalil Mack shirsey … a black bra goes flying out from inside the shirt onto the floor in front of the other gents in the gym. Ah. Um. Whoops. There is a rumor out there from a good dude, Evan Altman at Cubs Insider, that a lot of you are already talking about, and I don’t want to ignore. But I also want to make sure I frame in a fair, cautious way. It’s something of a friend of a friend situation – purportedly a personal assistant in the Brewers org heard that the Cubs had met with Bryce Harper yesterday – and I don’t think any of us can say with 100% confidence that it’s legit. Even if some version of it is legit – perhaps a quick phone call with agent Scott Boras – you have to keep in mind that there was always the possibility that when it was time to accept an offer, Boras and Harper would check back in with the Cubs just to make sure they were out. Indeed, that *was* a rumor earlier this offseason. Moreover, the latest round of Harper reporting had four teams in – Phillies, White Sox, Nationals, Padres – and then at least one other team hanging out at the periphery. As we speculated, it would make plenty of sense if that peripheral team was the Cubs, just wanting to keep in touch in case they had been able to put together a salary-dumping move. That does not mean the Cubs are seriously involved at this point in any case, and, as much as it pains me to say, I really don’t believe that they are. If the meeting happened, it actually makes more sense that it was just designed to apply a little more pressure to the serious suitors – I mean, if the Brewers know the meeting happened, then other teams surely know, too. A small but meaningful potential bonus on new Cubs reliever Tony Barnette: he might have minor league options remaining. Well, that’s not quite right – he does have minor league options remaining, but it’s only a “might” that the Cubs can actually use them. As a guy who spent so many years in Japan, Barnette has the ability to negotiate certain special terms into his contract, which could include the right to decline an optional assignment to the minors. To be sure, if Barnette is healthy, his recent track record suggests the Cubs will want him in the bullpen regardless, but with the club clearly taking a “volume” approach to filling out the pen to open the year, having the flexibility to keep as many guys as possible in the organization would be a nice bonus. 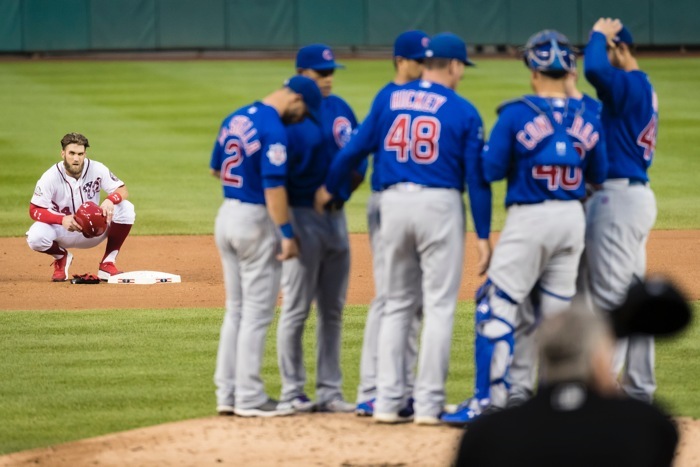 The Cubs have been selected by ESPN for another Sunday Night Baseball game, this time on May 19 against the Nationals, which means the Cubs will have three straight Sunday Night Baseball games in May. The first two are fine as far as travel goes, but that third one, the new one on May 19, is kind of a bother – the Cubs will have that late game Sunday night in Washington, then have to travel back home for a night game the following day, which happens in the middle of a 16-game stretch with no off-days. Not horrible (like the end-of-season schedule). But not ideal. On the bright side, more national exposure! In total, the Cubs are currently scheduled for five Sunday Night Baseball games, including the Little League Classic on August 18. Only the Yankees and Red Sox are currently slated for as many appearances as the Cubs. In 2016, the Cubs didn’t have a draft pick until Pick 104. Those drafts tend to be throwaways. In 2019, we may see up to 9 players from that draft reach AAA Iowa, perhaps even a couple in Chicago. Mekkes, Brothers Short, Miller, Giambrone, Swarmer, Hatch, Rucker, Robinson. Rangers have signed RHP Jason Hammel to a minor league contract with a spring training invite. He pitched for KC the last 2 years and has 96 career wins in 377 games. Also OF John Andreoli has been claimed on waivers by SF. He was DFA on Jan. 28. Nomo is 50 years old, and last appeared in MLB 11 years ago. Bonus: did you see how the right fielder caught that ball? Today the #Nats announced that backpacks may not be brought into Nationals Park in 2019.